Pub in Bexleyheath, also known as Polly Clean Stairs. 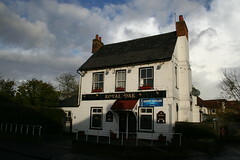 It closed in 2009 after the death of the landlord, but reopened under new management in December 2010. See the Pubs Galore comments linked below for more. Not yet visited by an RGLer. Last edited 2011-06-26 14:37:10 (version 15; diff). List all versions. Page last edited 2011-06-26 14:37:10 (version 15).